Bring Me Their Hearts is book 1 in the Bring Me Their Hearts series. I'll admit the title and the cover drew my attention and I thought it would be a retelling for some reason, but it's not. I'm always a bit leery of the YA genre, so I grabbed this one from the library just in case. It was a pretty good read and I'll be interested in grabbing the second installment when it is released. We start off meeting Zera, our leading lady and finding out that she is a Heartless. A Heartless is immortal and basically serves a witch and does whatever they are told to do. They can't go back to their human life until their heart is returned to them by their witch. Zera has spent the past 3 years doing Nightsinger's bidding and is at a loss when she's approached with a deal. Get Prince Lucien d'Malvane's heart and you'll get your own heart back. The only catch is that she has to pretend to be one of the nobles in court and get chosen by the Price as his bride instead of one of the other girls. Sounds easy, right? Not at all, Zera has to cram training on how to be a proper lady into such a short time period because Heartless are not little delicate flowers. She only eats raw meat, speaks her mind and isn't afraid to fight. I couldn't wait to see how she'd manage to snag the Prince, if she could at all. 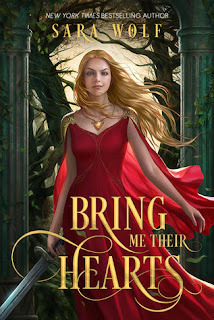 Bring Me Their Hearts is an interesting take on "The Bachelor" type trope with paranormal mixed in. I was pleased with quite a few things, but some things didn't quite hit the mark for me. At times Zera made me want to smack her, she's a snarky one but a bit too careless. A few scenes were a bit predictable as well, but overall I had a good time with the story. If you like YA novels with tons of snark and paranormal mixed in you might enjoy this book.